Space is one of humanity’s last frontier and a place we are eager to explore. As we prep many different missions to explore our solar system and beyond, we are continuously observing all that we can with things like Hubble, which monitors the galaxy in hopes of finding exoplanets and star systems among many other things. With Hubble and other space telescopes, we have found numerous exoplanets and many that are similar to Earth. One of the big questions that humans have is if there is life beyond Earth and on places like Mars or Earth-like exoplanets. Given the many different simulations were done on Earth to simulate how life might live on Mars and other planets with extreme conditions, it is easy to imagine microbial life. We want to know if there is intelligent life on other planets. To start answering that, scientists at places like SETI (Search for ExtraTerrestrial Life) have been sending out signals to space in hopes of getting an answer. Recently, researchers at the Sonar Organization have sent out a signal filled with art and science to the exoplanet GJ273b because it is similar to Earth and may have life on it that could respond. The message is expected to arrive in 2030 as it makes it way out of the solar system and into interstellar space. Since its launch in October 2017, the signal is now in the Oort Cloud, which is a theoretical cloud of icy particles and matter that is 470 billion km away from earth. It will take about 1.5 years to exit the Oort cloud and continue its journey. 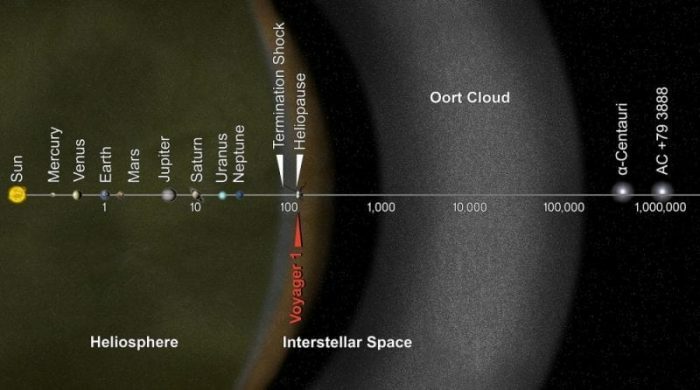 Voyager 1, which is near the edge of the solar system, would take 300 years to reach the Oort cloud and another 30,000 years to exit the cloud at its current speed. Fortunately, that is not the fate that scientists have Voyager 1 as they have recently sent it a signal to awaken it from sleep and resume work. Voyager 1 was launched in 1977 with the hopes of exploring the solar system with its sister, the Voyager 2 that was launched a few days earlier. Voyager 1 has “1” instead of a “2” because it would reach Jupiter before Voyager 2. Voyager brought us the first spacecraft view of Earth and the Moon. By 1979, Voyager has arrived at Jupiter and began to give us information on the giant. It showcased the first active volcanoes that were beyond Earth on the moon Io as well as the first instance of lighting detected beyond Earth. These discoveries among others helped scientists to develop better pictures of what space and planets could be like. By 1980, Voyager had made its way to Saturn and discovered three of the 62 moons of Saturn. Those moons were Atlas, Prometheus, and Pandora. The discovery of these moons also revealed to scientists the importance of having moons to keep the rings of Saturn in line. After Saturn, Voyager 1 stopped using its thrusters and continued to move away from Earth with the momentum that it had built. As it traveled, it continued to relay data about itself to Earth, but its mission was mostly over. Even after its main mission was completed, Voyager 1 continued to marvel the world. In 1998, it overtook Pioneer 10, a space probe, as the most distant spacecraft from Earth. 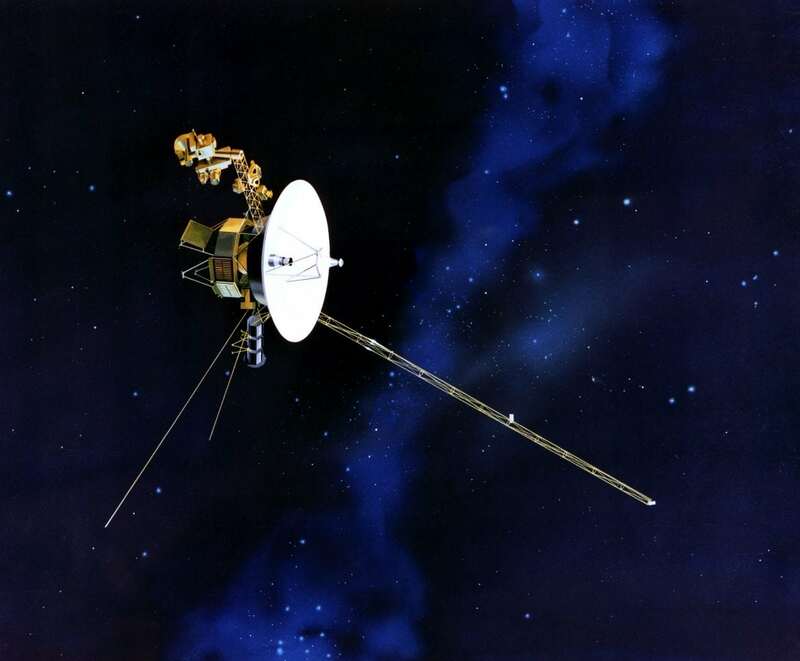 As Voyager continued its journey into space, it managed to enter interstellar space in August 2012. This makes it the first manmade craft to go beyond the solar system. The best part about this is that we can still communicate with the craft and it might have purposes yet to fulfill as it continues to collect information about space. After Voyager 1 had its main thrusters shut down, it continued to travel through space at an exit velocity, allowing it to leave the solar system. During that time it has been using its smaller thrusters to orient itself. But, these “attitude control thrusters” are starting to deteriorate and being 13 billion miles away from Earth makes it hard to fix those problems. Researchers at NASA’s Jet Propulsion Laboratory gathered to find a solution to this problem. They realized that since they can still communicate with Voyager 1, they can reactivate the thrusters it shut down 37 years ago and use those to orient itself instead of the deteriorating ones. The thrusters were used in a continuous manner when it was active and was not used in this way, which would require intermittent puffs of thrust rather than a continuous stream. So, the researchers dug into the outdated assembler language of voyager and sent a signal to turn on the thrusters and begin the intermittent bursts. After a critical 19 hours and 35 minutes of waiting for the signal to be sent and respond, the researchers found that the thrusters worked as intended and would extend the life of the craft by a few years. Since Voyager 2 is en route to reaching interstellar space in a few years, they plan to do the same thing to it as well. Now that Voyager 1 has awakened, NASA has to give it a new mission to work on as it continues to travel deeper into space and towards the Oort cloud. They have created the Voyager Interstellar Mission (VIM), which is an extension of the original mission of voyager to explore the solar system and make important discoveries. Since many of its instruments are still working, researchers hope to use Voyager to characterize things like the makeup of the outer solar system, the outer limits of the Sun’s magnetic field, and the flow of solar wind. Many parts of the VIM had already started before the reactivation of the thrusters and the main part of looking at the interstellar space has begun. Scientists will have until 2020 or so to collect data and make discoveries with Voyager 1 before it cannot generate enough energy to power its systems. Even after Voyager 1 and 2 power down, they will continue to travel beyond the confines of our solar system and will be hailed as one of our biggest achievement and commitment to understanding and exploring space.